We were able to help Mary find one, but we still have a mailing list mostly of teachers looking for this Cookie Monster to use with their students. I’m looking for a Puffalump Cookie Monster with a back pack. 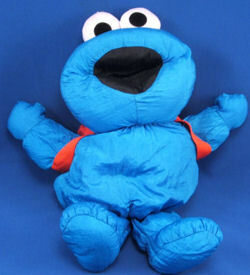 Covered in his characteristic deep blue Puffalump type fabric, this Sesame Street fellow has a huge black mouth and large white eyeballs sticking up on top of his head. This Cookie Monster has soft googly eyes, not the hard plastic eyes he usually has. He even has a tummy button, he’s so well made! He’s about 16″ long and about 12″ wide. I’m a speech language pathology assistant and current behavior therapy grad student, and have been inspired by Laura Mize who is a speech and language pathologist. I have read her books and watched her DVDs where she has talked about and demonstrated using the Cookie Monster in therapy. I think it would be an awesome addition to my therapy bag of goodies; furthermore, I think that kiddos will recognize Cookie Monster and be excited to see him. I primarily work with birth to 3 kiddos and younger autistic kiddos so I’m always searching and looking for new things to excite and interest them in therapy. Hi, I have one, but I honestly don’t have the time to create a listing for it while I’m in the process of moving 600 miles across the US. He is ready and in hand (never packed him yet), but just don’t have the time until I get settled in to the new place to create a listing. Thanks! Maybe one of these teachers will buy it from you, and it will be one less thing to pack up. thanks for all your help! i purchased one! I found a typo at the top of the entry. You are supposed to say “We NOW have a mailing list mostly of teachers looking for this Cookie Monster to use with their students.” Also, you need to change the status to “Found”, as she claims to have brought one! Also, can you send this link to the mailing list. It’s basically the same thing, but the only difference is that it talks. Thanks, Puella, for the heads up. The link to the talking version has been sent. You’re welcome! You could call me Puella Mami if you want! Thanks, Valerie I’m not sure anyone is still actively looking for one of these. I haven’t received any replies for the last few found. Hello, I noticed that the last few posts for the puffalump Cookie Monster were from 2012. Is it possible that there is still one available? I’d like to get Puffalump Cookie Monster. Is one available?